SEVASTOPOL, Ukraine, July 24, 2010 (AFP) - Leaving a cloud of dust in his wake, a black-clad Russian Prime Minister Vladimir Putin roared into a rally in Ukraine on a Harley Davidson and hailed bikes as a "symbol of freedom". 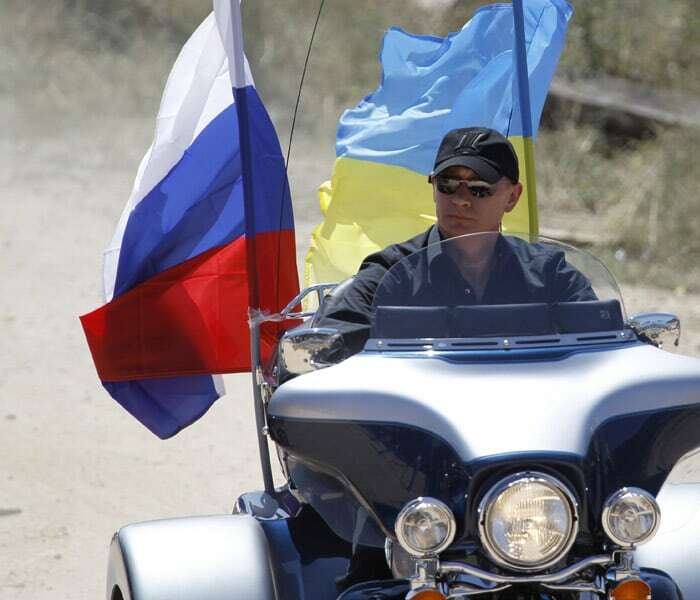 Putin drove into the rally of bikers on the southern Ukrainian peninsula of Crimea astride a gigantic three-wheeled Lehman trike conversion Harley Davidson motorbike, wearing dark glasses and waving his black gloved hands. The Russian prime minister is on a one-day trip to the south of Ukraine for talks with President Viktor Yanukovych but rarely misses any chance to burnish his hard man image. "I greet you brothers!" he told the gathering of some 7,000 bikers after dismounting and taking to the stage for a speech. The motorbike is the "the most democratic means of transport," declaimed Putin, who has been repeatedly criticised by activists for doing little to help political democracy in Russia. "It’s the boldest, the quickest transport and gives the biker the sweet feeling of freedom," said Putin. Obamas bicycle isn't even cool. BUT he knows Oprah and Putin doesn't.